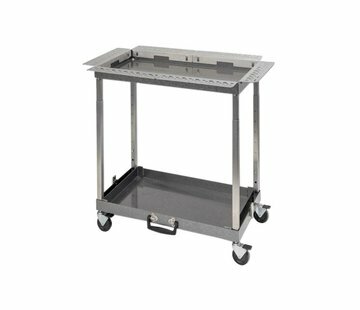 With this tool cart you always have a steady workbench to leave your tools on. And when you're ready, you easily collapse the bench and take it with you. Accessories stay locked in at the top so your tools are fully organized when you next need them. The cart comes with 2 Tool brackets but can accommodated up to 4 bracket two either side. Outside dimensions L: 94 cm x W: 50 cm x H: 30 cm.